A super RMVB Converter - RM RMVB DVD AVI VCD Convert Tool to convert RM RAM RMVB to AVI DVD VCD SVCD MPEG1 MPEG2 in batch mode, support RM RAM RMVB files very well. Convert RM RMVB to AVI DVD VCD SVCD MPEG Converter is a super software tool for converting RM RAM RMVB to AVI DVD VCD SVCD MPEG1 MPEG2 in batch mode. RM is realmedia format video. 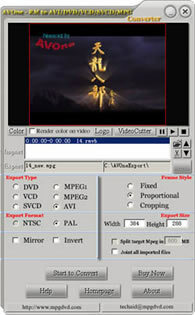 Split or joint imported video files; NTSC/PAL setting option; Suport Fixed,Proportional and Cropping frame; User-friendly interface lets you easily preview video files and convert; Split a large video file into several small mpeg file to burn on CDR, Joint function let you joint all imported file into one large video. You can adjust color for exporting video via color tools. Paste your own LOGO on exported video. Backup your many rm to a few DVD disc, and watch your DVD on your TV continuously. RM to avi, RM to dvd, RM to vcd, RM to svcd, RM to mpeg format, rmvb to avi, rmvb to dvd, rmvb to vcd, rmvb to svcd, rmvb to mpeg. convert RM RMVB DVD AVI VCD SVCD MPEG is super easy, support RM RAM RMVB files very well ! WinAVI Video Converter Burner - Convert all Video to DivX MPEG AVI and burning Mpeg AVI to DVD VCD SVCD, Has the fastest Video Audio decode / encode engine in the world, convert any media to DVD in 1 hour with stunning video and audio quality! Video Covnerter and VCD DVD Burner all in one.